Can you make a comet? What is in a comet? Some scientists call it a "dirty snowball in space". You can make your own comet with a mixture of materials that might surprise you. Ask the student to create a testable question. Example: Will the “comet” I create change in the presence of a hot light source? Pour 1 cup of water into the plastic bag. Place 1 cup of potting soil in the plastic storage bag. What are real comets made of? 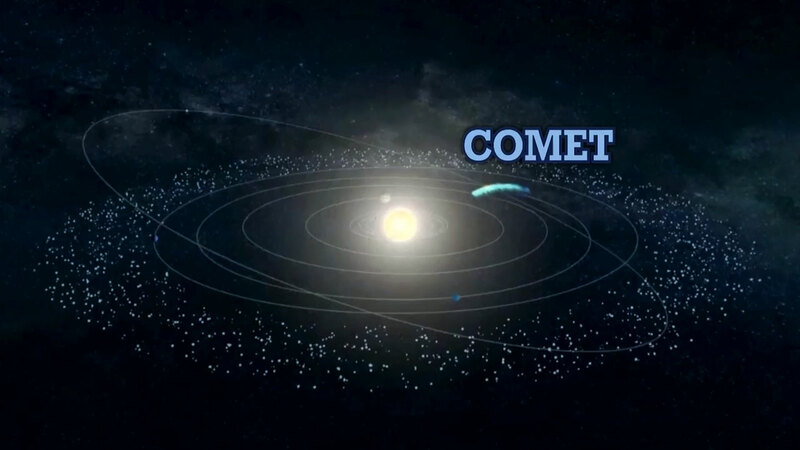 Comets are basically dusty snowballs that orbit the Sun. They are made of frozen substances, such as water, carbon dioxide, ammonia, and methane, mixed with dust. What is dry ice made of? Why does it release "smoke"? Dry ice is the solid form of carbon dioxide, a molecule that is found as a gas in the air. It needs to be cooled to -109.3 °F to become a solid - that’s crazy cold! Because it’s SO cold, when it is exposed to room temperature air, it undergoes sublimation, which means it changes from a solid directly back into a gas. Why is dry ice dangerous to touch with your bare hands? Dry ice is extremely cold!! If you touch it with your bare hands, it can give you a dry ice burn. You should see what looks like steam coming off of the comet! The “steam” is really the carbon dioxide sublimating from dry ice back into a gas and taking other particles in your “comet” with it! The light helps you see these particles as they rise. What do you notice about the direction of the comet’s tail? The tail of your “comet” in this experiment will generally rise upwards, but in space, the solar wind that comes from the sun will push the comet’s tail so that it is pointing away from the sun! What happens to the comet if you leave it for 30 minutes? 3 hours? 24 hours? As the dry ice sublimates and leaves the comet as gaseous CO2, it will eventually start to leave holes and craters in your “comet.” If you let it sit long enough, it might even break apart or disintegrate! This also happens to comets in space after long exposure to the sun. What made the comet’s tail appear? The heat from the light source. Comets are cosmic snowballs of frozen gases, rock and dust, roughly the size of a small town. When a comet's orbit brings it close to the sun, it heats up and spews dust and gases into a giant glowing head larger than most planets. The dust and gases form a tail that stretches away from the sun for millions of kilometers. In our experiment, we model these elements with a few household items. The potting soil used represents the dust floating in outer space that has come together to form the comet. The ammonia and soy sauce both represent organic compounds found in space. The dry ice represents the cold temperature in space which causes all of the space matter to clump together. While the water will freeze into a solid as it is added to the dry ice and then melt into a liquid as it warms, the solid carbon dioxide skips the liquid state and goes directly from a solid to a gas as heat energy is added in a process called sublimation. As a comet orbits the sun, it begins to disintegrate and the sun illuminates the particles falling off--creating the "tail" we see. The compounds containing carbon that are typically found in living things. Example: Comets contain amino acids, which are organic compounds that are the raw ingredients for proteins that make for living things. Something composed of two or more parts, elements, or ingredients. Example: Water is a compound since each molecule of water is made up of two hydrogen atoms and one oxygen atom.